points you have, or instead prefer to use the Consul and the Tribun to skilfully pull the strings behind the scenes. Whoever succeeds in using their connections and manages to play their cards cleverly will at the end deserve their victor's laurels. First the play area is set up. The 6 dice discs are laid in ascending order in a row between the two play- ers. The "money" and "cards" discs are laid at either end. 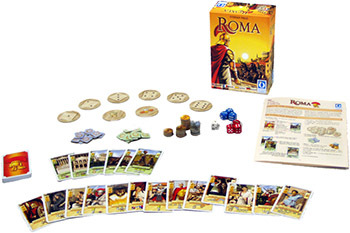 The players each receive 10 victory points and the 3 action dice in the color of their choice. The money, the remaining 16 victory points and the battle die are laid ready. All the cards are shuffled. Each player receives 4 cards in his hand. Each player gives the other player 2 cards face-down. The remaining cards are placed in a pile face-down on the table. Cards which are discarded during the game are placed face-up to form a joint discard pile. The younger player is the starting player and begins. This player lays his cards face-down on his side of the play area. When laying the cards, the players have a free choice as to which card they put next to which dice disc. However, it is not allowed to have more than 1 card next to any dice disc on either player's side. The other player then lays his 4 cards on his side. As with the first player, this player can also choose any 4 of the dice discs. Both players then turn their cards over and the starting player begins the game. 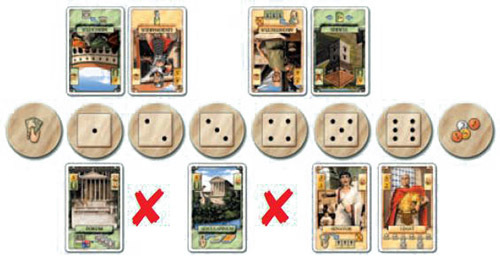 If not all the dice discs are occupied by the player's own cards, the player whose turn it is has to put 1 victory point back in the general stockpile for every unoccupied dice disc on his side. The starting player has to put 2 victory points back in the stockpile during his first go as he only has 4 cards at the start which means that only 4 dice discs are occupied. The player throws his 3 action dice. If all three dice show the same number, the player can throw (all three dice) again. Note: it may be of advantage for the player to accept a throw where all three dice show the same score. The player must decide based on the situation in the game. There are 4 possible types of action which can be carried out. It does not matter how many times or in what order they are carried out. The player decides which of the dice scores thrown in phase 2 he wants to allocate to which of the diffe- rent actions. 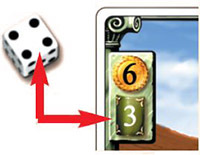 It is not possible to divide up the score on one particular die or to allocate one dice score to more than one action. Example of a complete move: It is Stefan's go. After he has handed back 1 victory point (1 unoccupied dice disc), he throws his dice: he gets a "3", a "4" and a "6". He decides to carry out the following actions. He uses his "3" to draw three cards. He keeps one of these in his hand (a "Legat"). Both the other cards are discarded. He uses his "6" to take money from the stockpile; this means he receives 6 sestertii. He plays a card (the "Legat" he has just drawn) by laying it next to the dice disc with four dots. He does not need a die for this. He pays the price shown (5) and gives the corresponding number of sestertii back to the stockpile. He now uses his last die (the "4") to activate the "Legat" card next to the 4. This wins him 2 victory points in this case. Example: playing the "Aesculapinum" card costs 5 sestertii. 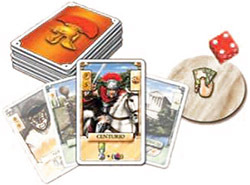 Cards are taken from the player's hand and placed face-up. When laying a card, the player always has to allocate the card to a dice disc. Cards are only placed on the player's own side. If a player wants to lay his card next to a dice disc which has already got a card next to it, the card which is already there is removed and put on the discard pile. Laying a card costs the number of sestertii shown on the card. A player is only allowed to lay the card if the complete amount has been paid. The money is put in the general stockpile. A player puts one of their action dice on the "money" disc and takes the number of sestertii shown on the die from the stockpile. 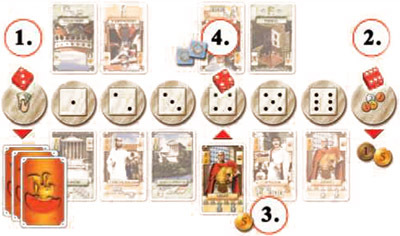 The player places one of their action dice on the "Cards" disc and draws the number of cards scored with the die. The player keeps 1 of these cards in their hand, the rest are discarded face-up. If the pile has been used up, the discarded cards are mixed and placed face-down to form a new pile. Players can have as many cards in their hands as they want. Example: a "4" was allocated to this action. The player can therefore draw 4 cards from the pile and choose one of them. The player puts one of their action dice on the dice disc showing the same score. This activates the player's card lying next to this disc, i.e. the instructions on the card are carried out. If more than one die shows the same score, the card can in turn be activated more than once. Some cards enable the player to attack the opponent's cards. If there is a battle, the player whose turn it is - this player is always the attacker - throws the battle die once. If the player rolls a score equal to or higher than the defence value of the card under attack, the attacker wins and the card is discarded. In all other cases nothing happens. If a player has ended their turn, i.e. all their actions have been carried out, play passes to the other player. The player rolls a "4" with the battle die, the defence value of the opponent's card is only "3"; the card has been beaten and has to be discarded. Note: attacking and defence values can be changed by lay- ing more cards. All changes are always taken into consideration. 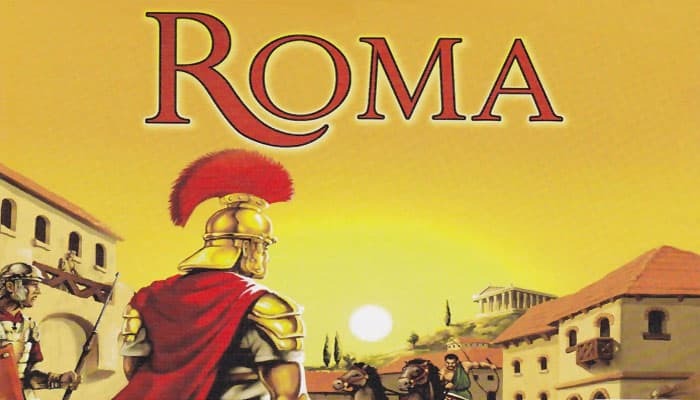 Note: the following cards can start a battle: Legionarius, Velites, Centurio and Onager. The Sicarius, Gladiator and Nero cards also have an effect on the cards the opponent has laid; they do not, however, result in a battle. there are no victory points left in the stockpile. Note: if there are not enough victory points left in the stock- pile for the last payout, the missing points are credited to the respective player.